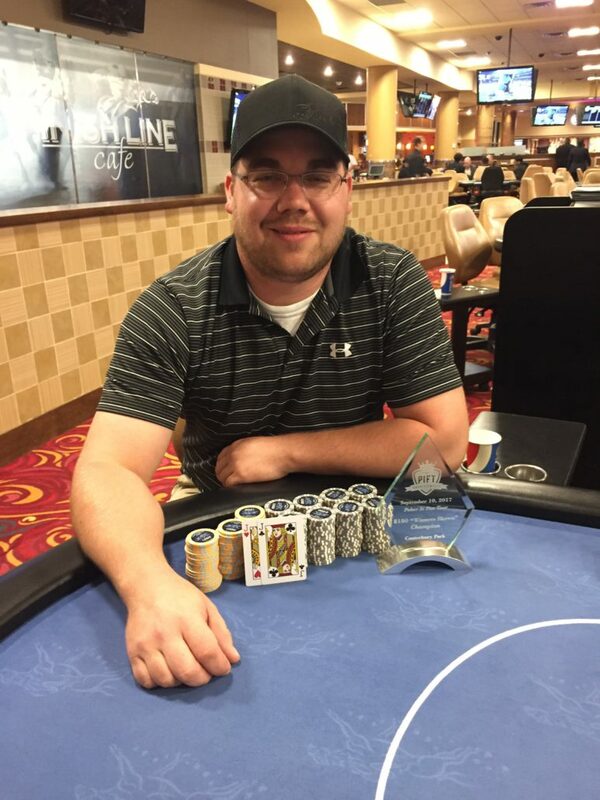 Your second ever Poker Is Fun Tour Champion, Cody Torke! Cody Torke bested a field of 90 tough players who gathered at Canterbury Park in Shakopee, MN, to play PIFT’s “Winners Shown” event, doing so as the chip leader at the first break, and carrying that momentum through some ups and downs, all the way to the swingy final table that saw several players go from a large stack to a small stack and back up. 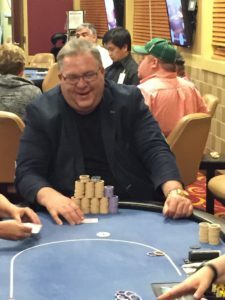 We had 17 players make the money, including players from Wisconsin and South Dakota in addition to a bunch of our local favorites including but not limited to Tom Marsland, Michelle Day, John Somsky and Andy Kaplan. 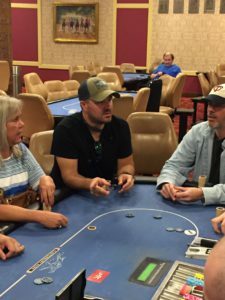 This event also saw not 1, but two deals get made at the final table. The first with 4 left guaranteed each player $1,800 and left $1,227 to play for. And then when heads up, the two players guaranteed Day $2,400, Torke $2,200, and left $227 plus the trophy to play for. We also did a lot of good for Second Harvest Heartland. Between our 1% withheld from the prize pool, along with the charity pledge partners we have, unofficially we’ve raised a grand total of $2,472.30. Tremendous job players, and a huge thank you to the businesses and individuals that made pledges! Thank you for following along this weekend, and thank you to the many players who supported the Poker Is Fun Tour by playing in it, talking about it, tweeting about it and otherwise spreading the word. Stay tuned for more PIFT events in the coming months! Congrats to our runner up, who played a fantastic game this afternoon and evening, Michelle Day! Our two heads up players have struck a new deal. Michelle Day, who currently holds the chip lead, is now guaranteed $2,400. Cody Torke is now guaranteed $2,200 — meaning they’ve left $227 to play for along with the trophy. Congrats to you Tom, well played today! 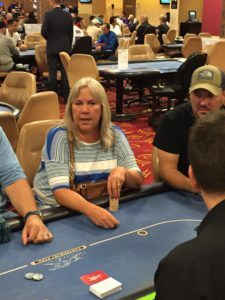 Michelle Day moved all in from the button for 130,000, and got some action from Tom Marsland in the small blind. Marsland was in the lead with A♠ J♦, against Day’s K♥ 2♥, but that changed quickly after the Q♠ 2♣ 9♣ flop. A 3♦ turn and 7♦ river secured Day the double up. The flop of 8♣ 4♠ 3♠ was just about Day’s worst nightmare, now having to fade another spade. A turn card of 3♦ kept her alive, as did the 8♦. Both players with 8s full of 3s got to chop the pot. A huge pot developed between Cody Torke and Tom Marsland. By the river, all Torke’s chips were in the middle against Marsland, with the board reading: 5♦ 4♣ 2♦ 5♣ 7♥. Torke held: 2♣ 2♥ for a full house. Marsland held: 8♠ 6♣ for a flopped double gutshot that rivered a straight. Congrats to Eric, and thanks for making the long drive out to Canterbury! The four remaining players have agreed to each take $1,800, and play it out for the remaining $1227 with the winner taking all (along with a swanky trophy). Awesome! http://www.piftpoker.com/wp-content/uploads/2017/04/pift-logo.png 0 0 Schneids http://www.piftpoker.com/wp-content/uploads/2017/04/pift-logo.png Schneids2017-09-10 20:13:112017-09-10 20:13:11A Final Four Deal! Cody Torke raised to 12,000 under the gun, 4 handed, and action folded to Eric Waldron in the big blind who reraised to 25,000. Torke made the call. The flop came down A♠ Q♦ T♥, and Waldron continuation bet 25,000. After 5 seconds, Torke laid down his hand, which had to be a relief to Torke as he rolled over 9♦ 9♥. http://www.piftpoker.com/wp-content/uploads/2017/04/pift-logo.png 0 0 Schneids http://www.piftpoker.com/wp-content/uploads/2017/04/pift-logo.png Schneids2017-09-10 20:08:292017-09-10 21:35:443 Overcards? No Fear.